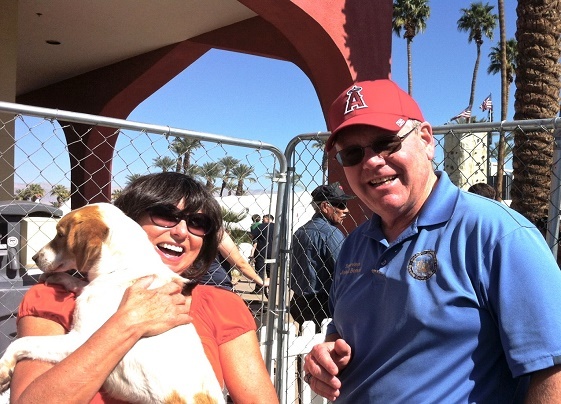 THOUSAND PALMS – Supervisor John J. Benoit and his wife, Sheryl, will pay the adoption fees for the first 50 pets at the county’s desert shelter adopted during #Benoit50, an event they are spearheading to place shelter animals into loving, forever homes. On Sept. 9-10, adoption fees will be waived for the first 50 dogs and cats over 6 months old adopted at the Coachella Valley Animal Campus. The fee waiver will also extend to the pet’s spay or neuter surgery, a microchip and current vaccinations. After the first 50 adoptions, there will be a special $20 adoption rate, lowered from the regular adoption rates of $105 for dogs and $65 for cats. A dog license is not included and is required within 30 days of adoption if the adopter lives within the Riverside County Department of Animal Services’ coverage area. Fees range in price based on the city of residence. Shelter hours are 10 a.m. to 6 p.m. Friday, Sept. 9 and 11 a.m. to 5 p.m. Saturday, Sept. 10. The Coachella Valley Animal Campus is located in Thousand Palms, 72-050 Pet Land Place. The Benoits have adopted two dogs, Taxi and Anabelle, and a cat, Jack, who are beloved members of the family. Supervisor John J. Benoit is the chairman of the Riverside County Board of Supervisors, representing the eastern two-thirds of Riverside County as the 4th District Supervisor. The 4th District stretches from Palm Springs and Desert Hot Springs, south to the Salton Sea and east to Blythe and the Colorado River. Supervisor Benoit’s office hours are 8 a.m. to 5 p.m. Monday through Friday.